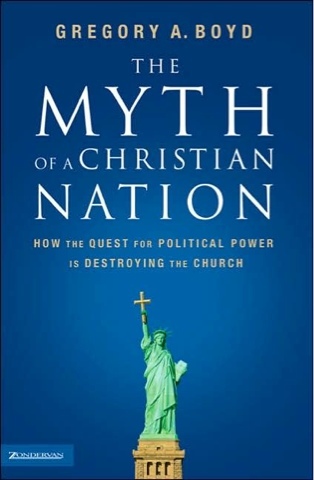 This morning I started reading The Myth of a Christian Nation by Greg Boyd on my new iPad. This book would have been hugely transformational for me, had I read it a couple years ago. But for now, though it's a bit old-hat, it is really interesting. Some of his language about "demonic" element of the "kingdom of the world" is somewhat outside my preferred theological framework, but overall I can tell that it's going to be a really good read. "...evangelicals fuse the Kingdom of God with a preferred version of the kingdom of the world (whether it's our national interests, a particular form of government, a particular political program, or so on). Rather than focusing our understanding of God's kingdom on the person of Jesus--who, incidentally, never allowed himself to get pulled into the political disputes of his day--I believe many of us American evangelicals have allowed our understanding of the kingdom of God to be polluted with political ideas, agendas, and issues." Boyd goes on to flesh out a clear dichotomy between national identity, particularly an american one, and Christian identity. But I wrestle with his language. Realizing that I'm only in the second chapter, I tread lightly, but early on, his dichotomy is clearly between " the kingdom of God" and "the kingdom of the world." I've often wrestled with the question of how far we should take dichotomies of kingdom of "the world" and kingdom of God. Are they not in fact both realities of this world? I don't like to speak of "the world," which is, as I understand it, the space we currently occupy, as an antithesis of God's reign, however Pauline it may be to do so. The foundational tenet of Christ's message in the gospels is that the kingdom (or dominion) of God is here and now, in this world, "at hand." So it can be very misleading to speak of "this world" as an antonym for God's kingdom. This language fits right in with the theological framework of the disembodied gospel (where heaven is some ethereal post-mortem experience, totally separate from and for the most part irrelevant to the work of God here and now, the work in which we are invited to participate). This is why it's important for us tget away from this language. This is why I have gravitated toward the language of "God and empire"--in essence, the same dichotomy that Boyd fleshes out in his book, minus the misleading. The kingdom of God, after all, must occupy the world, at least eschatologically. That's what we see in revelation 21, as opposed to a disembodied gospel. The challenge then, if we are to affirm this world as God does, is having the clarity and discernment to identify "empire" wherever it rears its ugly head. The author of Revelation uses beasts to describe this hidden but present reality. It is systemic, spiritual, individual, and everywhere in between. Indeed, it is the very dichotomy of heaven and hell. I don't think that we evangelicals have done well in identifying the empire among us. This is what boyd is getting at. Perhaps the greatest evidence for this lies in our sheer paralysis when it comes to discerning systemic injustices. When one church calls out an injustice, another church fights them on it. Our nationalistic identiy has become part of the fabric of our religiosity. If a sermon even dabbles in discernment of empire in our own government, perhaps the first place we should look, it is deemed "anti-American" and the congregants will flock to a more "patriotic" church. If we were to separate our identities and forsake all other than our allegiance to Christ, I think we'd be a bit more at liberty to speak out against the powers that be. That's why Boyd's work is so important.